Enter the magical arena of one of China's most famed mythological characters in Dragon's Temple slot by IGT. 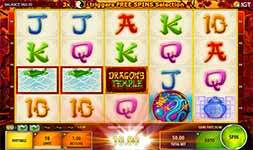 This 5-reel 4-row game offers 50-lines of dancing dragon action where Expanding Full-Reel Wilds and Free Spins can earn you extra rewards. Enter the magical arena of one of China’s most famed mythological characters in Dragon’s Temple slot by IGT. This 5-reel 4-row game offers 50-lines of dancing dragon action where Expanding Full-Reel Wilds and Free Spins can earn you extra rewards. This good looking game is everything you might expect from IGT. It’s got great graphics, terrific sounds and understandable yet rewarding bonus features. You’ll be trying to make winning combinations from Chinese-themed symbols like a temple, money packets, vases, dragons and koi fish. The dragon’s in particular are a great symbol to hit as they act as an expanding full reel wild. You can also hit three or more yin yang symbols to earn the free spins bonus round. Expanding Full Reel Wilds – The Dragon medallion is the game’s wild symbol and substitutes for all symbols in the game except the yin yang scatter.